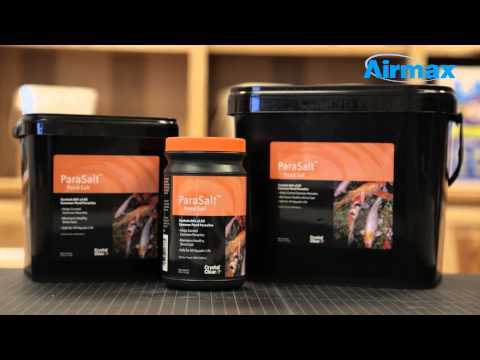 CrystalClear® ParaSalt™ - Airmax® Inc.
CrystalClear® ParaSalt™ is formulated to increase koi and goldfish electrolytic intake. Electrolytes are critical in building and maintaining a healthy slime coat. Electrolytes such as potassium are essential in wound repair and in times of heavy stress (ie – during water changes or clean-outs). Salt is excellent for mucous production when healing from a wound. ParaSalt™ will also help ward off and remove most common protozoan parasites found in koi and goldfish such as: Dactylogyrus, Byrodcytulus, Epistylis, Trichodina and Chilodonella. ParaSalt™ can be used in a salt bath for heavy infestations or as a routine treatment to keep parasites from entering the pond environment. Apply ParaSalt™ once a month at the prescribed rates above and after a water change, clean-out or during a seasonal change. Most pond fish stress during these times and need the electrolytes to assist in repairing their slime coating. For salt baths, add 16 oz of ParaSalt™ for every 5 gallons of water in an isolated bath or quarantine tank. Place infected fish in an aerated (use an air stone) bath for 5-10 minutes or until fish begins to turn over. Remove fish immediately if fish shows any signs of stress. After bath, immediately remove fish to a quarantine tank for 30 minutes and monitor fish closely. After 30 minutes the fish can be placed back into the pond. Slowly introduce the fish back into the pond water. Place the fish in a bag of the bath water and let the bag float on the pond for 15 minutes. Release the fish into the pond when the water temperature in the bag and pond is the same to avoid shock. Do not over apply ParaSalt™ and follow directions thoroughly for maximum effect. If you are unsure of the bath application please consult your local CrystalClear® pond professional.